Figs grow happily and easily in a pot. The plants do not have high nutritional requirements, and are therefore satisfied with a limited amount of land. If the fig tree is forced to still develop its typical habit in this limited space. The coldest period of the year (late November to early March), the plants can bring out the best in a sheltered environment. For example in a shed or garage. Light they do not need, because they have no leaves. They must be moistened occasionally to prevent dehydration. After this period, they can be “activated” by giving them plenty of light and water. Watch out for late frosts. Outside figs in pot may mild Dutch climate generally survive well. Fig trees are beautiful on the terrace or balcony and create, like olive trees, Mediterranean atmosphere. All pots are useful for the fig. 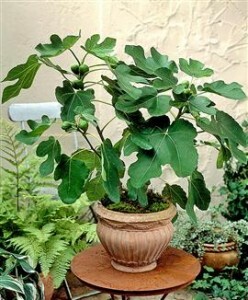 To get a nice compact plant is the best fig annually to pots in a slightly larger pot and not the same in a big pot. Regular potting soil is perfectly adequate for the fig. It is better when the ground is complemented with additional coarse sand for drainage and a fraction of clay to take better retain moisture and nutrition. Olive substrate of the Bergerie complies. Figs are additional fertilizing with cow manure and lime. Figs are fond of water in the summer months, daily watering pleasing to the fig. It is also noticeable when the fig is thirsty, the leaves go then slack. The fig recovers quickly when it gets enough water.